I have always been fascinated with divination, or the practice of seeking knowledge of the future or unknown through magical means. However, I have never dabbled in the art before. I decided to change that, starting with runes. Why runes? 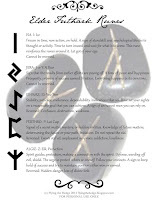 First, runes are the most popular form of divination, making access to detailed information easy. Second, I recently took a trip to the Great Lakes with my mother and grandmother where I collected a large number of beautiful stones. While most of my stones contain fossils (I went to school for paleontology/evolutionary biology) and will not be used, many I picked because they spoke to me. I pondered over what to use them for before it hit me like a sack of stones (ha!). They told me to turn them into runes, but I don't know the first thing about runes. Well, I just spent the last few weeks learning everything I can online about runes and how to use them. 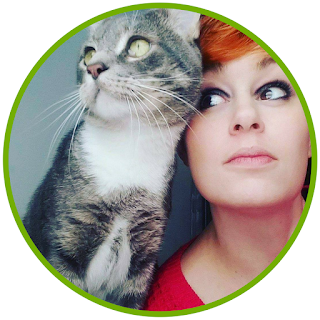 Since there is so much information available, I decided to turn my learning journey into a mini-blog series. What better way to solidify my understanding than to teach others? Runes are the most popular method of divination. I chose to work with the Elder Futhark alphabet, which is the oldest and most commonly used runic alphabet. There are, of course, several other alphabets including Cirth, Gothic, Hungarian, Turkic, and Younger Futhark. There are between 24 and 25 runes in the Elder Futhark alphabet. Below is a comprehensive list of all the runes and their meanings. Sign of abundance or financial strength in the present or near future. Abundance through effort, possession won or earned, luck, success. Reversed: Abandonment of plans, loss, disappointment, failure. Strength, speed, untamed potential. Sign of great energy and health and sudden/unexpected changes (usually for the better). Freedom, courage, understanding, wisdom. Reversed: Missed abilities, weak willpower, lack of motivation, ignorance. Reactive forces, conflict, destruction. Usually a sign of violent change. Purging. Reversed: Danger, defenselessness, stubborn mindset, lies. Bad person. Sign of a message from within or insight. Advice from others, inspiration, blessings, chance encounter. Harmony, truth, and wisdom. Think carefully so you will know what to do. Reversed: Trickery, failed communication, delusion, manipulation by others. Sign of that you are about to embark on a journey, either physical or your lifestyle. Vacation, relocation, evolution, change in perspective. Seeing the right move for you and deciding on it. Reversed: Crisis, stasis, disruption, dislocation, demotion, upsetting plans, or even death. Vision, knowledge, inspiration, revelation. A sign of opening new strength, energy, and power. Also associated with passion. Reversed: Exposure, loss of hope, disease, breakup, instability, withdrawal. Sign of gifts from both sacrifice and generosity, thus indicating balance. Unity of self and others. Marriage. A sign that you don't need someone. Peace, pleasure, self worth, joy, serenity, happy results, prosperity. However, it is also a sign of going "over the top." Reversed: Sorrow, dissatisfaction, disappointment, delay, possession by a higher force, frenzy. Out of our control. Wrath of nature. Uncontrollable forces, especially in regards to weather or within our unconscious. Trial. Resistance, distress, delay, restraint. Sign to proceed with caution and that will power can overcome distress, confusion, and conflict. A time to exercise patience and face your fears. Reversed: Improper course of action, toil, deprivation, want, poverty, hunger. Frozen in time, non-action, on hold. A sign of standstill and psychological blocks to thought or activity. Time to turn inward and wait for what is to come. This rune reinforces the runes around it. Let got of your ego. Sign that the results from earlier efforts are paying off. A time of peace and happiness. Prosperity, promise of success earned. Fruition. Everything happens in its own time. Stability, patience, endurance, dependability. Indications that you have set your sights on a reasonable goal that you can achieve. A sign of an honest man you can rely on. Signal of a secret matter, mystery, or hidden abilities. Knowledge of future matters, determining the future or your path. Initiation. Do not repeat the old. Reversed: Events stalled, unpleasant surprises, addiction, loneliness. Spirit guides, protection, making a connection with the spirit. Defense, warding off evil, shield. The urge to protect others or oneself. Follow your instincts. A sign to keep hold of success and try to maintain position either won or earned. Reversed: Hidden danger, loss of divine link. A sign that the circle is complete and that your goals are going to be achieved. Honor, self knowledge, self awareness, wholeness, power. A time when power will be available to you for positive changes. Success. Honor, justice, authority, leadership. Rationality and analysis. Willingness to self-sacrifice. A sign of victory in any competition or legal matter. Finding yourself. Reversed: Low energy, lack of enthusiasm. Strife, war, conflict, failure. A sign of general fertility, both mental and physical. Renewal, birth, promise of new beginnings, new growth. Love and desire. Be prepared and cautious in what you do in regards to family. Reversed: Family problems, domestic troubles, loss of control, sterility, deceit. Transportation whether by horse, car, plane, boat, or other vehicle. Change for the better. Harmony, loyalty, trust, teamwork. A sign of an ideal marriage or partnership. Move forward carefully, focusing on the tools that you will need to get there. Confirms without a doubt the meaning of the runes around it. Reversed: Sudden, unexpected change that is not wanted. The self and its place in the collective conscience of humanity. Personal reflection. Your attitude toward others and their attitudes towards you. Social order. Expect to receive aid or cooperation. Intelligence, forethought, skill. Reversed: Depression, mortality, self-delusion. Expect no help. Flow, fertility source, healing, renewal. Dreams, fantasies. Health and healing. Emotions are connected to all things. Reversed: Not listening to your inner voice. You may be making the wrong decisions and poor judgements. Stuck, obsession, sickness, suicide. INGWAZ- NG: Ing, the earth god. Male fertility, internal growth, gestation, family love, human warmth, common virtues. Finish up what you are doing, tie up lose ends, and start something new. Breakthrough, new day, awakening. This is the time to plan or embark on a new journey. Security, certainty, transformation, happiness, hope. The power to change. A sign that you may inherit property or possessions. Group prosperity, spiritual heritage, values, safety. Reversed: Slavery, poverty, homelessness, prejudice, stuck. Not letting go. The last rune is the blank rune*. This rune was not used historically, but instead was created in the 1980's. Many believe you shouldn't use a blank rune. I haven't decided if I will use this rune or not, but is represents Fate or Destiny and cannot be reversed. If it shows up when asking a question, it usually means it is not the right time to ask. It can also represents major changes in your life, good and bad. I'll leave it up to you whether or not you wish to include this rune. I hope this has been informative. If you already practice rune divination, do you use the blank rune or not? Want to print a copy of this for your Book of Shadows? Click below for your free copy! Please note there are 5, yes 5, separate pages. *Blank Rune is not included. Have you every read the Futhark by Stephen Flowers? It's a great book to have on hand for anything to do with runes. Every household in my tribe owns at least two. I can't go without mine, I take it everywhere with me!